If you’ve ever owned a home before, you understand the frustration of discovering your doorbell doesn’t work and the effort to replace it. Old-fashioned doorbells have an amazing amount of wires that are snaked through walls and frames. With today’s technology, it’s not necessary to struggle with endless wire lengths. A wireless doorbell is a simple product that uses signals between a button and chime. You’ll know when anyone is at the door regardless of your location in the house. Because this technology is so popular, there are many different products available for your home. Evaluate some of these wireless doorbells, and compare them to your needs. Style, safety and reliability are the core functions of these devices. Honeywell is a name that’s well-known in the home-improvement industry. With that fact in mind, their wireless doorbell comes in at first place because of its high-quality features. Once it’s installed, you’ll be able to hear your visitors coming with a pleasing chime to go along with the notification. Household security has never been so important, and this doorbell offers reliability and installation ease in each package. Explore all of the perks that this doorbell provides so that you can make an educated buying decision. Unless you’re near the old-fashioned doorbell chime, you won’t hear it from a bedroom or the yard. Intruders often rely on this scenario and walk right into the home. You’ll be aware of everyone moving through your home when you use the Honeywell chime with the doorbell. Grab the chime and place it near your gardening task. As long as the chime is within 450 feet of the doorbell, it will ring reliably. This operational range is ample for most properties because the land may not extend farther than a few hundred feet. As you shop around for wireless doorbells, you might be under the impression that every chime will be a dull, ding-dong sound. Honeywell’s device doesn’t limit your musical choices. In fact, it comes with six songs programmed into the chime. You simply need to listen to each chime and decide on the best one for your home. From Westminster to Fantasy, your favorite tunes are not difficult to find. If you have a large property, you’ll be pleased to discover that expansion is possible with this doorbell product. You can match one button to one chime box to designate a specific doorway entrance. Alternatively, use one chime box and three buttons spread out across the home. When one button is activated, the chime plays the tune designated for that door. There are almost endless possibilities for expansion throughout your home. For more complex expansions, you may want to contact the manufacturer or read the manual very thoroughly. Honeywell’s wireless doorbell does have some limitations, but they’re very far-reaching factors. You aren’t limited to just chimes and buttons connected through this system. Consider adding door contacts or motion detectors. A visitor doesn’t have to press the doorbell in order to activate the chime. If door contacts break their connection, you’ll be immediately notified that an entrance has been compromised. Motion detectors will also notify you of any movement on the property. The value that this doorbell brings to your property is almost priceless. Don’t be concerned if you have a hearing-impaired person at your home. The chime isn’t useless for them because Honeywell added an indicator light. As the chime rings, you’ll see a visual cue on the receiver box. Seniors and other people will instantly know that someone is at the door. Your loved ones can also take advantage of the chime’s volume control. Enhance the visual cue by turning the ringer up to high volume. Your hearing-impaired loved one will see and possibly hear the sound as visitors press the doorbell. 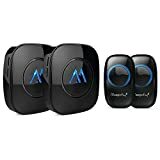 Some consumers have complained that their wireless doorbells bought from other manufacturers don’t have any mounting parts. They end up using double-sided tape or other material in order to hang the doorbell. Honeywell wants your wireless system to look as professional as possible. Each kit comes with mounting hardware that will match perfectly with the included components. Your wireless doorbell should last for many years when the mounting hardware is properly attached to the structure. Consumers also have concerns about the doorbell’s power source. The chime may not work if the doorbell can’t signal that a person is present. The manufacturer decided to install a coin battery in the doorbell. These small, power sources are found at any store that sells traditional batteries. Coin batteries last for a long time and rarely lose their charge to a short. Simply replace this battery when the chime and doorbell seem to have transmission problems. The chime should react almost immediately to the doorbell being pressed. Check the doorbell every few months so that the battery is always in good working order. One doorbell-and-chime kit is relatively inexpensive from Honeywell, but consumers are warning others about those add-on items. If you have more than one door to support with a chime, adding extra components will culminate in an expensive bill. Ideally, you should evaluate your entire home for your doorbell needs. It might be necessary to cover only certain doors or windows with notification contacts, for example. In the end, your wireless doorbell should be an affordable device that only enhances the property’s value. 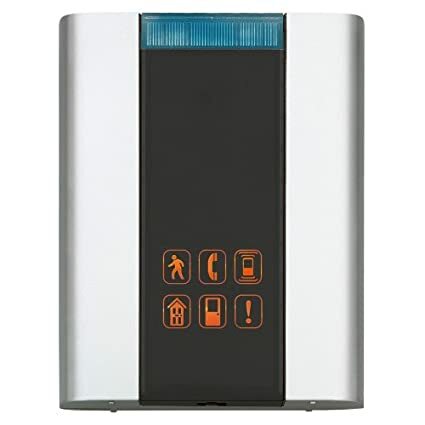 With a sleek, white exterior housing blue LED accents, the wireless doorbell by JETech is an exceptional find among all of the other products on the market. Consumers are even surprised that the doorbell comes with an included battery for instant use. The manufacturer took some of the most common requirements in the doorbell industry and packed the features into this particular model. If you’re looking for a low-cost doorbell with style, look no further than this product. Almost any decor matches with the JETech doorbell. The white housing has smooth curves that will blend into any room. The doorbell is subtle as well because it has an all-white exterior and a ringed button. 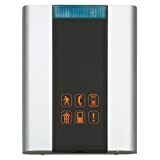 When a visitor presses the button, the surrounding LED lights will illuminate. Both the visitor and residents will know when the system is being activated. Take a close look at the receiver or chime. It doesn’t take up space on a table or other area because it plugs right into the wall. The manufacturer designed the receiver with a wall plug that keeps it perpetually powered and out of the way. You may want to plug it into a wall outlet that’s at eye level, however, because it’s an attractive addition to any room. This location also makes the sound more available to those residents with poor hearing. A feature that’s incredibly helpful to everyone in the home is the light activation. The receiver has a distinct musical note on its front side. As someone presses the doorbell button, this note will light up. It doesn’t stay solid, however, because that may not grab your attention. In fact, the LED lights will blink to the sound of the beat. As a result, you may see that the doorbell is ringing instead of hearing it. Some consumers are happy with a wireless doorbell that has less than five chiming songs, but the JETech model comes with 50 tunes. One drawback to all of these selections is picking a favorite tune. You’ll have to press the chime button several times until you find the best selection. Change the chime once a month or keep it the same all year long. Customizing your doorbell chime allows you to personalize your home even further. Although the manufacturer didn’t design the doorbell for this purpose, some consumers are using it as an alert system for their loved one. Grown children might keep the receiver in their bedroom at night while grandma or grandpa wears the doorbell button as a necklace. If there’s ever a problem, the grandparent simply presses the button. The receiver reacts, and the grown children can solve any issues. This unofficial use of the JETech doorbell system makes it a versatile device in any household. You’ll be pleased to note that there are no complicated installation instructions involved with this system. The button comes with adhesive and screws to hold the system in place along the door frame. When it’s correctly positioned, the doorbell should remain in place for many years. You can always relocate it if necessary. Simply use new adhesive in the new location. As a result, you can have your chimes at home, the dorm or any other area that visitors frequent. The receiver assembly is so well designed that many people can’t find the volume or chime buttons. Run your fingers against the left side of the receiver, and you’ll discover both of these options. Toggle through the chimes while altering the volume. Once you set the system, you’ll only want to return to change the chime through the seasons. 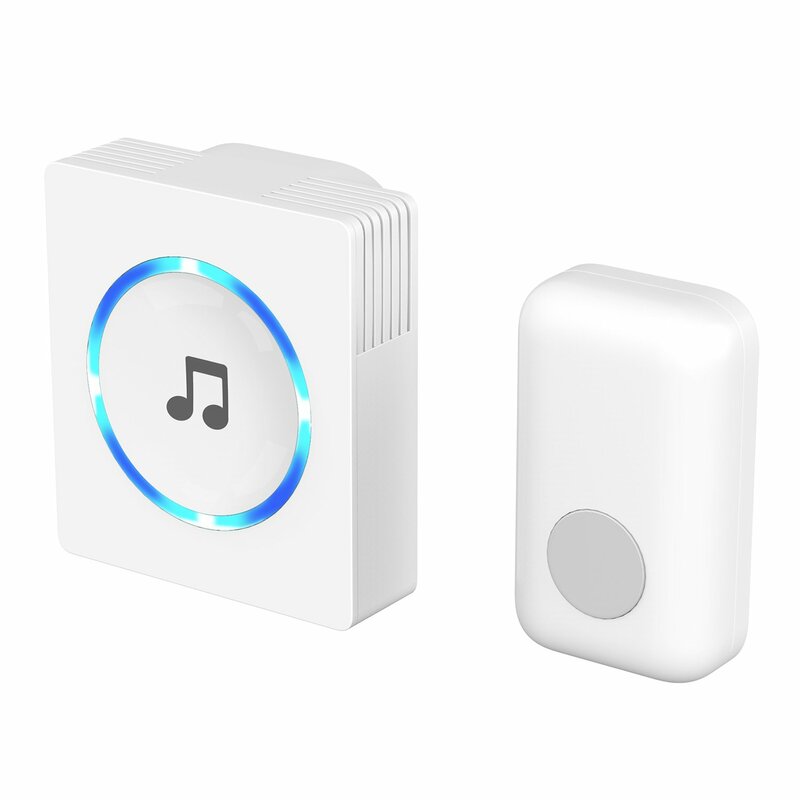 From spring songs to holiday themes, this wireless doorbell is packed with many songs. 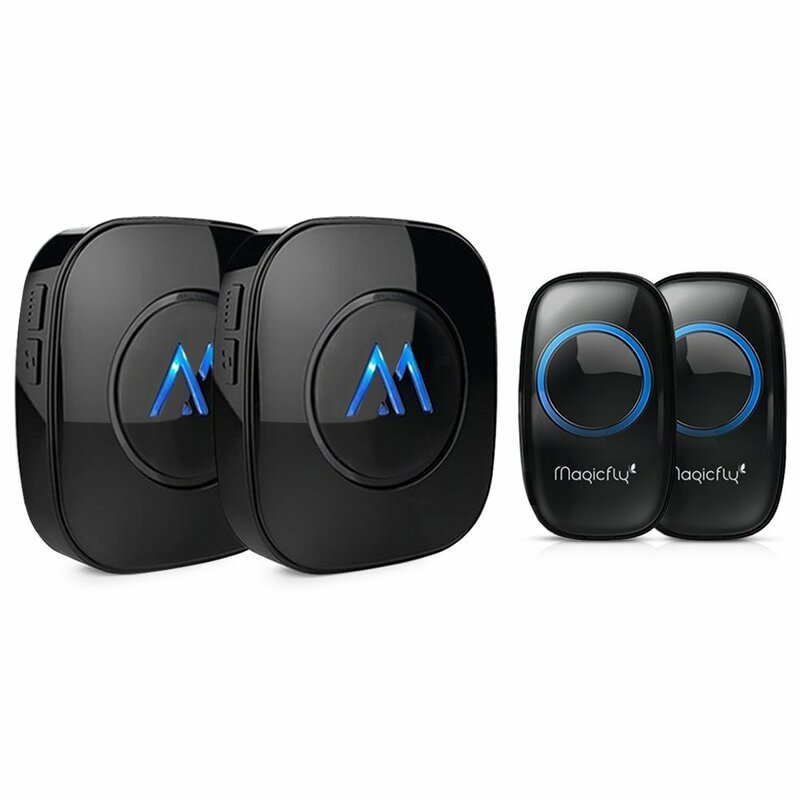 One of the most stylish wireless doorbells is the model offered by Magicfly. With a shiny, black housing, this doorbell works with any dramatic decor. Its design even has a radical “M” printed on the chime with an LED brilliance. Although some consumers have reported some problems with this doorbell choice, the price point is worth the goods that you receive. Most top picks among wireless doorbells are only one chime and doorbell configuration. Magicfly sweetened their deal by combining two buttons and two chimes together into one package. With one low price, you can outfit two separate doors with these devices. You’ll always know who is visiting at your home and which door to answer. Both chimes can be set for different songs, or you can allow them to play the same song. For homes with a large square footage, hearing the chime throughout the space is both convenient and safety driven. The manufacturer advertises their product as waterproof. It’s important to note that this claim is mainly based on the button’s design. The button is subjected to the weathering elements because it’s installed outside. However, some consumers have reported that the term “waterproof” is an overstatement. The button shouldn’t be exposed to excessive rain or moisture because it can damage the internal parts. Interior chimes are definitely not waterproof because they have a vented backside and an electrical outlet that’s vulnerable to moisture. Simply be aware of the doorbell-system’s installation location, and you shouldn’t have any moisture issues. Because Magicfly adds a vent to the chime’s backside, this system will rarely overheat. It has enough ventilation to circulate the necessary air during operation. Generally, the chime won’t ring on a constant basis because you would need visitors pressing the doorbell each hour. The manufacturer also states that the system is free from any interference because of the high-quality housing materials. Although this statement might be true for some users, other consumers have reported that they’ve experienced issues with transmission signals. You’ll need to experiment with your doorbell in order to find a sheltered area away from any interference. One of the best features of this doorbell is the songs. You can pick from over 50 songs that are popular in almost any household. Select seasonal favorites or a basic ding-dong sound. You can also adjust the volume between four different settings. Allow your infant to rest with a low-volume setting while turning it up for residents who’re hard of hearing. Consumers report that the instructions aren’t in native English. They’ve been translated from another language, so you may need to take a closer look at these instructions before installing the unit. In general, the installation is relatively intuitive as you plug in the chime and hang the doorbell. You can greet visitors only a few minutes after adding all of the hardware to your home. When you want simplicity built into your wireless doorbell, look for the budget-friendly chime from EasyAcc. It has a basic, white housing with easy-to-read controls right on the chime. There are no complicated buttons to locate along a housing’s edge because the manufacturer places them right on the chime’s front side. Although this doorbell has some limitations compared to other products, a small home can be perfectly served with this quality system. This reasonably priced wireless doorbell offers a 328-foot range, which is ample for most homes. Be aware that this range doesn’t include obstacles. If you have a home with many walls or stairs, the range might be adversely affected. For most consumers, they’ve been pleased with the doorbell’s application in their homes. An unusual feature of this doorbell is its songs. There are more than 30 different songs, but they aren’t all derived from those classic tunes heard at nearly every home. You might hear a ballad from a tragic, romantic movie or a voice saying “welcome” as a ding-dong sound is being made. If consumers want a unique doorbell for their home, this product is a perfect choice. You might have a loved one who struggles with hearing the doorbell. Although this product is considered a budget pick, it doesn’t lack in visual features. In fact, the chime does have an LED light on its front side. As a visitor presses the doorbell, the LED light will flash in unison with the selected tune. This LED light is relatively small compared to other products, however, so the chime may need to be placed near the residents so that the light can be effective in their peripheral vision. The manufacturer makes it clear that their doorbell system does have limitations near metal objects. Transmission signals generated between the button and chime can experience interference if either of these products are located near metal items. Stereos, computers and other products should be moved away from the doorbell system. You’ll have better use of the doorbell as a result. You aren’t limited to just adhesive stickers for your doorbell installation. EasyAcc has hidden wall screws that reside inside the housing. 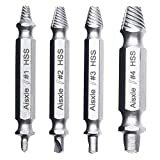 The manufacturer even supplies the screws for an easy installation. Simply open the button housing to access the wall screws. Pick an appropriate area along your door frame for the installation. Use the wall screws to permanently affix the button in place without any worries about the adhesive wearing out. The button device requires a battery, which is supplied by the manufacturer. Pay careful attention to the instructions, however. The doorbell cannot operate with the insulating tab still in place. Pull the tab from the doorbell and complete your installation. 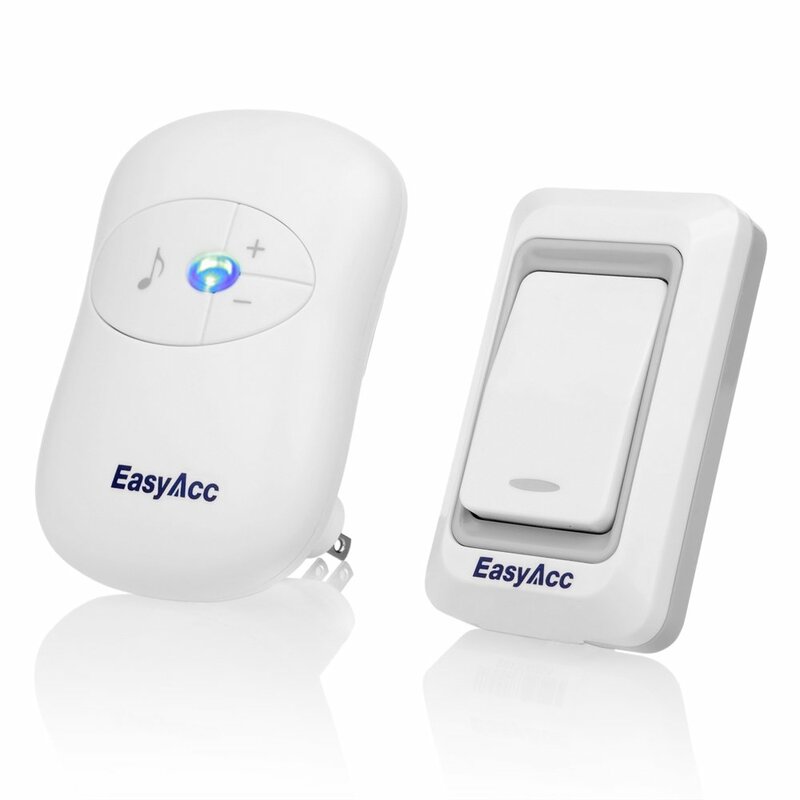 The EasyAcc system should work only a few minutes after plugging in the chime and hanging the doorbell. An important feature that you should always consider is the receiving range of the chime box. As you compare different doorbells, you’ll notice the specifications changing between all of the various models. Some models have a 500-foot range while others will boast 1,000 feet. However, be wary of these huge range values. These numbers are based on your home having no obstacles to the signals. Every home has obstacles, from fire walls to chimney pipes. Test your chosen doorbell when you receive it. Place the chime in various rooms in order to locate a clear signal transmission. As a result, you’ll discover the true receiving range. If you have a full household, you may want to have a chime with dozens of different songs. You can designate certain songs for specific doorways, for example. Alternatively, simply use the different songs to designate the time of year. Volume control is always an important part of the doorbell system too. After installing the doorbell, set the volume at a low level. Ask everyone if they can hear the doorbell. Increase the volume until it’s readily heard by everyone. Some systems may not have the best volume control, and you’ll miss visitors at the door as a result. Be aware that most systems only come with one kit that includes the doorbell, chime and mounting equipment. You may want to have other accessories added to the system for security purposes, such as motion detectors. As you shop for other accessories, verify that they’ll work with your specific system. In fact, the accessory manufacturer should have clear notes on compatible products. If you want to avoid compatibility issues, simply buy accessories made by the doorbell manufacturer. These items may be more expensive than third-party products, but you’ll connect to them with no problems. As technology continues to improve, you’ll be able to have even better features for your wireless doorbell. Consider adding a camera to your doorbell if the manufacturer offers that feature. The camera activates when the person presses the button. In some cases, you may be able to access the camera view through your smartphone. Adding these complex products to your current doorbell system may be difficult, however. For simplicity purposes, hire a professional to help you with camera and smartphone compatibility. Some doorbell systems have the components necessary for the upgrade. The professional can also tell you if a new system is required for the alternative components. Different technologies don’t always work in harmony together. Some consumers are concerned that they’ll need these doorbells installed by professionals because of the multiple components involved. The included instructions are very helpful, and they walk you through any setup scenario that’s possible. You can always contact the manufacturer’s hotline or go online for tips as well. These doorbells are meant to be “plug and play” devices that work almost as soon as they’re taken out of the box. Start with the button’s installation and systematically move on to the interior chimes. You’ll have a sense of accomplishment when the doorbell reacts reliably with each visitor.